The Northshore/Concord area, the 37922 zip code, is a seller’s market and “very hot” right now. In fact, home values in this zip code have risen over 5% in 2018. But why is 37922 so desirable? We'll tell you what we love about it! Water, water, water! The Northshore area features amazing access to Fort Loudon Lake and beautiful mountain views. Fort Loudon is an extremely popular East Tennessee recreation destination, known for great fishing, boating and breathtaking views. An SEC football fan? Like to boat? 37922 is a perfect match. Board your boat at Concord Marina and leisurely make your way downtown to Neyland Stadium, home to the Tennessee Volunteers football team. 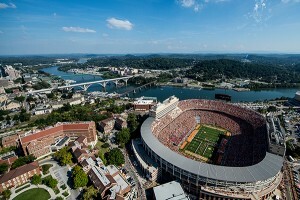 Be part of the Vol Navy and indulge in a truly unique tailgatingexperience for any football fan by sitting in a boat on the Tennessee River with views of the Gay Street Bridge and the Smoky Mountains! Just be sure to wear your orange and white checkerboard. Go Vols! Highest Great Schools ratings? That’s right. 37922 and 37934 boost the highest school scores based on Great Schools Ratings for public schools and all receive a 9 or 10. Thinking about moving to 37922? Though this zip code represents one of the largest in the Knoxville area, there are currently less than 200 homes on the market. Such limited inventory speaks volumes about how desirable owning a home with this zip code can be. Not many people want to move. And why should they? There is so much to offer! Have a home in 37922 and ready to sell? We know the area well, and have a ton of buyers anxiously waiting for new homes to hit the market. Are you looking for your dream home in Knoxville? We’d love to talk to you about all this wonderful, and one-of-a-kind area has to offer. Let’s talk! Call us today. The median home price in 37922 is just over $335,000. Updated:23rd April, 2019 7:46 PM.